Download and Convert YouTube to WAV in One Click, How? When I poked around the internet, I found such question being asked but there was no practical solution. Here I have to point out that WAV format is not on the list of YouTube supported video audio formats, that said, we can not download YouTube video in a WAV audio format even if we use YouTube downloader programs capable of ripping videos from YouTube unless we rely on YouTube videos to WAV conversion tools. Without further ado, I gather top YouTube to WAV downloader & converter for your reference. * Convert YouTube videos to WAV, MP3, MP4, MOV, MKV with 400+ profiles. * Compress video to file size 40% smaller than original with 80% quality reserved. WAV, short for Waveform audio file format and rarely referring to audio for windows, is a audio standard format defined by Microsoft and IBM. It is compatible with both Windows and Mac. Most MAV is uncompressed, thus it is highly acclaimed for the maximum audio quality, compared with other audio formats, e.g. MP3. Uncompressed WAV is commonly used by some radio broadcasters such as BBC, ABC, etc, but is hard to find over internet due to the large file size. Why Convert YouTube to WAV not MP3? There are two major file standards when it comes to digital audio - MP3 and WAV. It is no exaggeration to say MP3, a lossy format, revolutionizes the music world due to the good balance between file size and quality. So many people nowadays choose to convert YouTube video to MP3. But why would someone still prefer to transcode YouTube to WAV not MP3 or other audio formats? 1. MP3 is a lossy format. It the quality will be reduced when encoding audio to MP3. While unlike MP3, WAV is a 100% accurate, lossless, bit-for-bit reproduction of the source material. So the video quality is lossless while encoding. So if you stress on quality, you'd better convert YouTube and encode the YouTube video into WAV format but not MP3. 2. WAV has more to do with its familiarity and simple structure. This makes it easy to process and edit. For an easy video editing after YouTube downloader, to extract WAV from YouTube videos is much preferred. 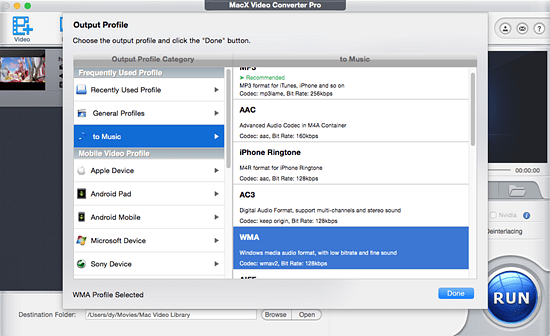 MacX Video Converter Pro tops YouTube to WAV converters mentioned above neither because its output files are permanent nor because it supports Windows(Window 10 included) and Mac OS (macOS Sierra supported). What makes it gleam among the rest is its fast speed, unaffected output quality in YouTube video download and extract WAV audio from YouTube videos. 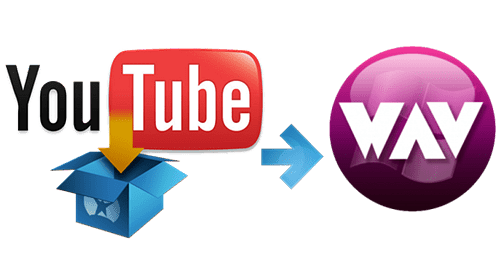 It brings you the very real possibility to download and convert YouTube video to WAV format in a matter of a few seconds with origianl audio video quality reserved, be it YouTube 4K UHD or 1080P video. With over 180 video, 14 audio formats supported and 350＋ preset profiles for Apple Android devices, it allows you to save any YouTube video in WAV, MP3, AAC, FLAC, iPhone Ringtone etc. or convert YouTube video to MP4, MOV, AVI and many more for playback on iPhone X/8/7/6S/6/6 Plus, Samsung Galaxy S9, etc. * Free download YouTube to WAV converter and run it. For pc users, go to windows version. * Copy and paste the URL of YouTube video to the box frame. * Choose the YouTube video resolution, file size, codec and format as you wish. This YouTube video downloader supports downloading 4K YouTube and other HD videos fast. * After clicking "Download Now", YouTube video download process will be done automatically. Head to "to Music", choose "WAV" as output format from the drop-down window. Note that you won't sacrifice audio quality during the YouTube video to WAV conversion process. Note: 4-5 minutes of WAV sound can consume 40–50MB of memory, making it difficult to store a decent number of files. For that reason, you can also take advantages of the YouTube to WAV converter to shrink down the video size by tweaking its parameter, e.g. resolution, bit rate, frame rate, etc and editing out the unwanted part using its edit feature. Select an output folder to save output WAV audio file by hitting "Browse" button. Click "RUN" button to start to rip WAV audio file from YouTube videos. It will be done speedily. VLC and Handbrake provide video conversion, but it's a pity that both of them fail to support outputting WAV format, that is to say, you can't count on VLC and Handbrake to get YouTube HEVC/MP4/FLV to WAV conversion done. Luckily, there are other programs can transcode YouTube videos to WAV audio. It is a free online file converter. Clean interface and ease of use are impressive parts I like most. You don't have to bother yourself to install the program or register. Whether casual users or subscribers users, you are allowed to batch convert video files. To download and convert YouTube video to WAV, you just need to choose "YouTube to WAV" mode, copy and paste YouTube video URL. It is significant to notice that only registered users are allowed to batch compression and batch download YouTube videos to WAV audio format. My only beef with the YouTube WAV downloader is that files can only be stored for a short time, within 24 hours for free users, 30 days for register users. It offers you a solution to extract WAV audio from YouTube video, that's all. If you are looking for a YouTube to WAV converter, it is a way to go. Audio clipping function is a plus for you. Regret to tell you that it only supports Window 8/7/XP/Vista, the above Windows users like Window 10 and Mac users have to switch way. The following bang-up YouTube to WAV conversion tool may surprise you. Here is a list of the top free YouTube audio converter online and desktop converter for you to freely download and convert YouTube to audio MP3, AAC, AC3, OGG, WMA, and other music formats with ease. If you want to convert YouTube to MP3 on Mac as a ringtone or extract audio MP3 from YouTube video, this tutorial will show you how to convert Youtube (48 or 60fps) to MP3 on Mac with a powerful free YouTube to MP3 converter.